Researchers at the Royal Veterinary College's (RVC) Queen Mother Hospital for Animals (QMHA) have made a ground-breaking discovery in the treatment of Alabama rot, a deadly disease which affects dogs. Alabama rot, properly known as cutaneous and renal glomerular vasculopathy (CRGV) first emerged in Alabama in the 1980s, giving it the nickname 'Alabama Rot'. The lack of understanding on how it spreads or can be stopped has led to high fatality rates for dogs who develop it. The reason for its sudden appearance in the UK six years ago also remains a mystery. It causes small clots in blood vessels, which eventually result in skin ulcers, tissue damage, and kidney failure in many cases. Many theories have been put forwards about the cause; anything from E. coli-produced toxins to parasites and bacteria. But without knowing the exact source it is impossible to develop an effective cure. 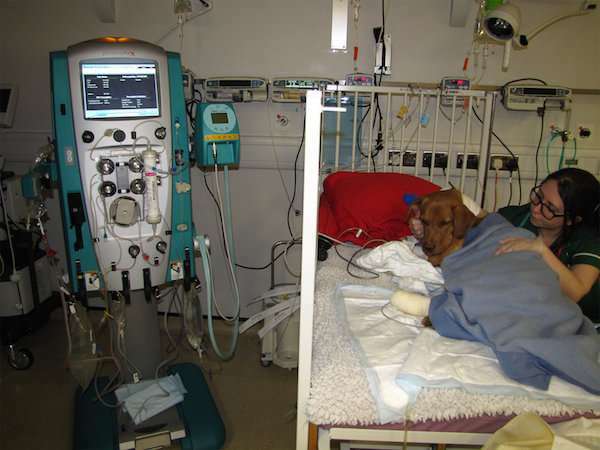 The breakthrough treatment offered by the RVC at QMHA is known as therapeutic plasma exchange (TPE) or 'plasmapheresis.' This method involves filtering all the patient's blood so that toxic substances, including whatever causes CRGV, are removed. Once filtered, the blood is returned to the patient. Its development was made possible by the discovery of the similarities between 'Alabama Rot' in dogs and thrombotic microangiopathy in humans, which is also treated with plasma exchange. The RVC clinicians reported that two out of six dogs who underwent plasmapheresis made a full recovery. The full findings of the research have been published in Frontiers in Veterinary Science. Dr. Stefano Cortellini, an author of the study and Lecturer in Emergency and Critical Care at the RVC, said "Despite the fact that only a third of dogs treated with TPE recovered from their disease, this is the first time that dogs so severely affected by CRGV have been reported to survive and so we remain optimistic that TPE may play an important role in the treatment of this deadly disease."